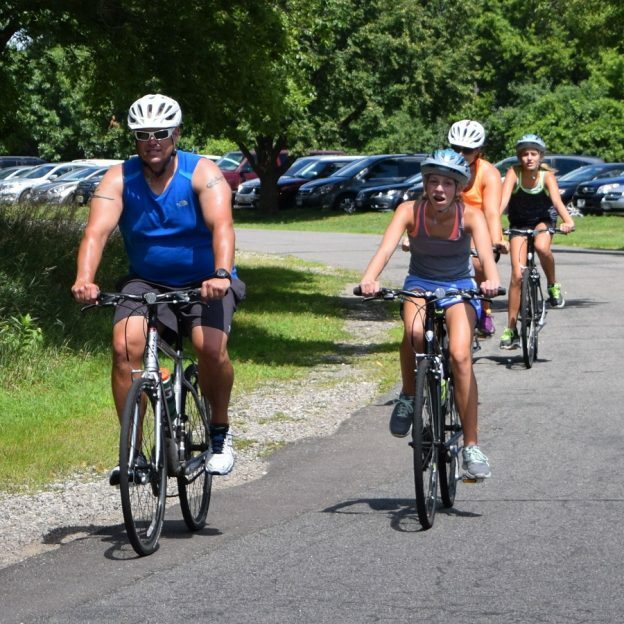 Mounds View is a great mix of busy and calm where you can ride your bike along creek side trails to visit festivals like the town’s 60th Annual Festival in the Park. This two-day jam-packed festival is a great way to start the end of summer vacation. Watch the fastest bike racers in the Midwest roar around Mounds View. Or give it a try yourself in the events beginner race. It all starts on Friday, August 18th, in Twin Cities Gateway community of Mounds View, MN. where one can find such an adventure. The festival begins Friday evening with a dance and leads into Saturday with bike races, games, a parade and more music to add to your summer memories. Whether you and your family come by bike, or by car, be prepared for an exciting day. Here safety mascot’s ride in the communities fire truck bucket Festival in the Park parade. Start your morning off on a run, literally. The Festival in the Park’s 5K race kicks off at the community center starting at 8:30 in the morning. After dashing through town, head over to the North Ball Field and see some snazzy cars. The car show is celebrating its tenth year at the festival and will be going on until 3:30 p.m. – with awards to see if your favorite car wins at 2 in the afternoon. At 10 a.m. get ready to catch some candy at the parade. 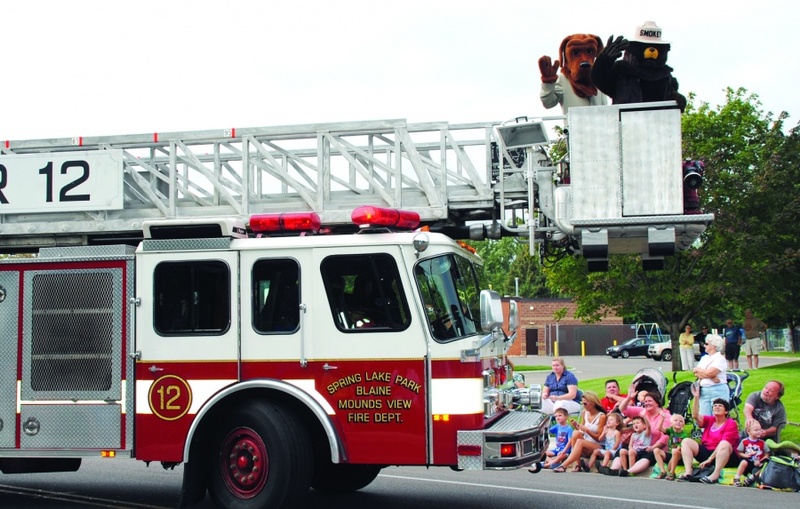 Afterward, take the kids over to the Front Parking Lot to have some fun with the Fire Department activities. At 1 p.m. there will be a K9 demo in the West Ball Field. It’s your time to show off your inner star. You have about a week or so to pick your favorite hit song and warm up your vocal chords. Karaoke is on stage from 2:30 to 5 p.m. and usually has some surprises and great singers to please your ears. This year’s band is Big Toe and the Jam, which starts playing at 5:30 p.m. to entertain the masses. Apart from having a fantastic name, Big Toe and the Jam will have you stomping your feet and singing along. From “Party Rock” to “Jesse’s Girl”, you don’t want to miss this eclectic set-list everyone will love. The night ends with a bang – fireworks over City Hall Park. 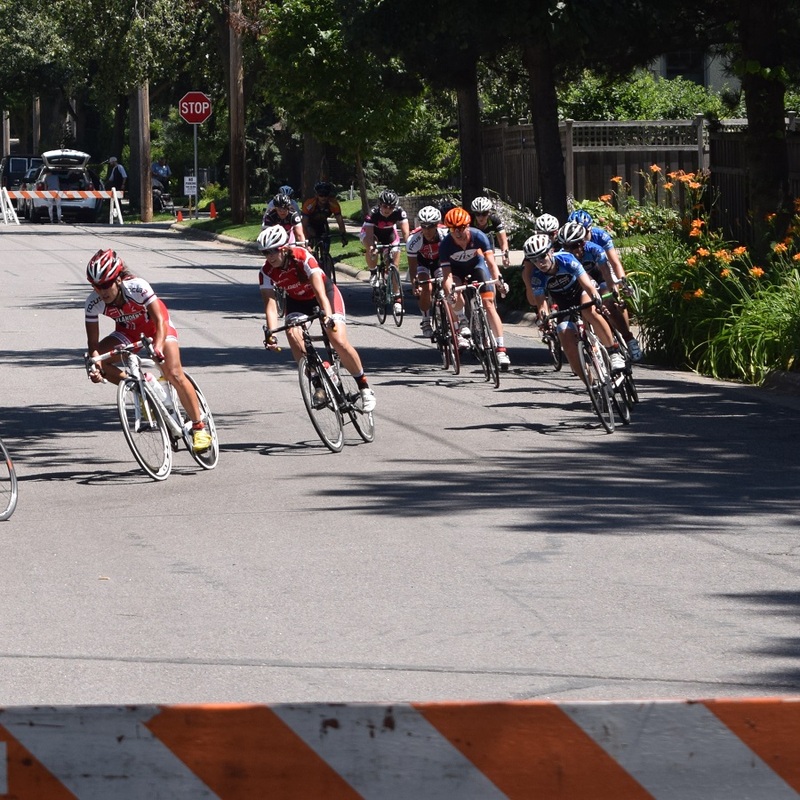 Watch as the USA Cycling racers sprint by the spectators, stirring the air as they dart by at the Festival in the Park. The Mounds View Festival in the Park Sprint Races starts at Noon with the last race starting at 6:05 in the evening. The course is a rectangle with the total distance of 1.1 miles. If you are feeling extra adventurous on this particular day, as this is a USA Cycling Race, there are one-day licenses available at registration. Otherwise, it is just as fun watching the cyclists as they dart by, pedaling as fast they can. Competing or not, the race will be an adrenaline filled phenomenon. So make plans today to head over to Mounds View on August 17 and 18th. Many who visit here also enjoy pedaling their bikes on the trail along the natural settings of Rice Creek. This entry was posted in News and tagged Anoka Co., Big Toe and the Jam, Bike race, bike rodeo, Festival in the Park, Jonah & the Whales, Minnesota e, Mounds View MN, parade, Twin Cities Gateway on August 4, 2018 by Andrew Ellis.